Makes working with ERCOT and PUCT easy. Real-time video, filings and news with curated archives and powerful search in an easy to navigate environment. Keeping up with ERCOT and the PUCT just got easier. 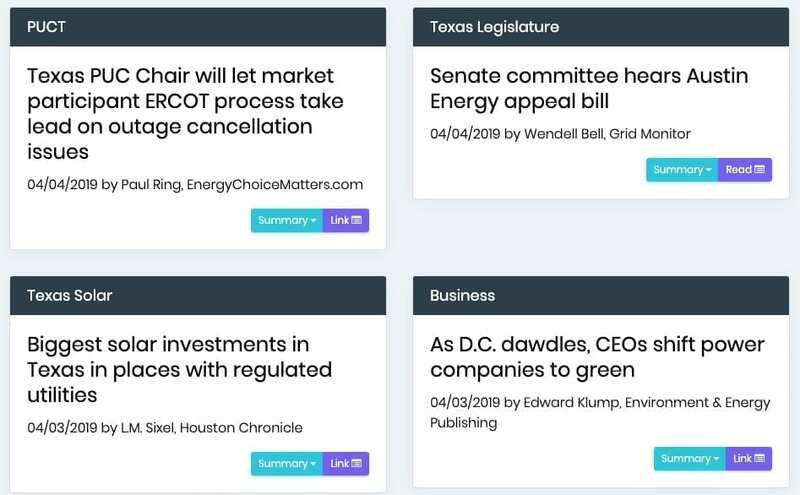 Follow any Control Number at ERCOT or PUCT with the click of a button and watch all of the filings, news, and videos come straight to your dashboard! Get all the PUCT and ERCOT filings in one place and track issues from one venue to the other. Add curated news and tagged video to the mix and experience ERCOT in a whole new way. Whether you are searching for filings, news, video or trying to figure out which NPRR was spun out of which rule-making project – it’s all here. Connecting the dots has never been easier. Live and recorded videos from ERCOT, PUCT and Texas Legislative Sessions. Daily curated and original news reporting about the power industry. Get a morning Power Breakfast newsletter of the day’s energy news. See related news, filings, and more with each agenda item in real time. Makes catching up and research easier than ever. One window replaces 3 different websites on your screen – compact, efficient, intuitive. Control numbers are linked across multiple platforms and venues. See at a glance the Senate Bill that spawned a rule-making which begat a Protocol revision which necessitated a guide revision. Subject matter links dramatically reduce research time requirements – spend less time digging and more time thinking and analyzing. Search legislative, PUCT, and ERCOT material in one convenient place. 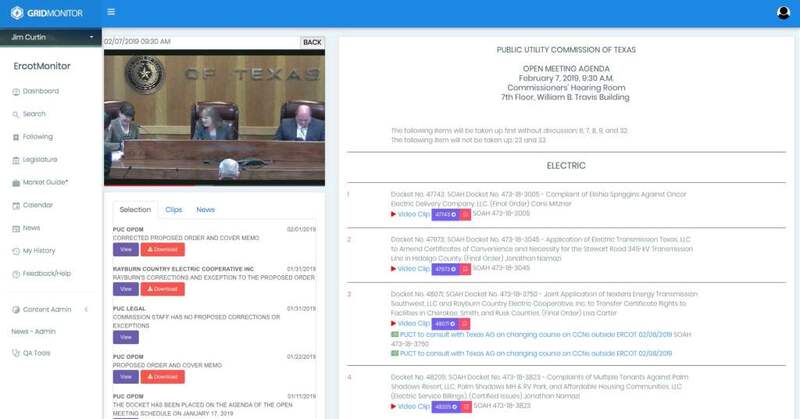 Live, archived and replay streaming videos of ERCOT, PUCT and Texas Legislative Sessions. Original reporting and analysis by genuine ERCOT subject matter experts with decades of experience in the Texas market. Curated links to third-party content – no more sifting through pages of irrelevant headlines. All content is thoroughly tagged and linked to related content, simplifying research. All relevant information automatically gathered in one place at your fingertips – filings, news clips, reports, video clips. Following dashboard tells you at a glance whether there has been any movement on your issues. Archive your issues for one-touch recall – all relevant material stays together for easy access anytime. Grid Monitor has been developed by a team of Energy Information and IT professionals who work day-to-day to track actions of ERCOT and the PUCT and have created Grid Monitor to help them do their job. Electric Power is a regulated industry — with governmental, quasi-governmental and industry participants — that affects every consumer in every market. The information flows are highly fragmented at every level from legislation to operations. Grid Monitor provides easier access to this information — for the professionals and participants at every level. Subscribe to Receive News and Updates from Grid Monitor.